Save Popponesset Bay from Tom Chartrand/Shoreline Digital on Vimeo. 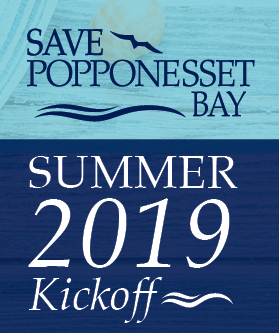 Save Popponesset Bay was founded in 1987 and is an all-volunteer, 501 (c) 3 organization, that works diligently to ensure that the Popponesset Spit and Bay remain intact for our children and their children to enjoy long into the future. SPB’s mission is to keep the waterways in and around Popponesset Bay safe and navigable and to protect the wildlife reserve on the Popponesset Spit for generations to come. The threats to this pristine and wonderful location are varied, numerous, and significant. Prior to 1987 a deep water channel to Nantucket Sound from Popponesset Bay did not exist. Boats with a draft of more than 20″ or more could not enter or leave Popponesset Bay close to low tide. In the late “60′s, Lew Schwartz, a New Seabury resident, formed a group he named Greater Popponesset Bay Water Ways Association or GPBWA. 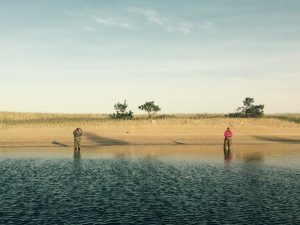 He and other local individuals repeatedly approached the Town of Mashpee over many years, arguing that the Bay and particularly the New Seabury Community deserved a deep water channel. All other significant harbors along the South Coast of Cape Cod had dredging programs and viable channels to ensure access to the Sound. While their efforts were unsuccessful, they had laid the ground work for the future. In 1987, a small group of New Seabury residents, many who were involved with GPBWA decided to try a different approach. Greg Smith and Kevin Harrington, with backing from Ray Tye, Lenny Petze, Don Brabranz, and financial pledges from others, approached the Town of Mashpee with an offer to break a stalemate over the issue. As financing was the significant “deal breaker” for the outer channel dredging, this group offered to help the Town financially by supplementing Town and State money with privately raised donations. The offer worked and plans for the first outer channel dredging began to take shape. Consequently, Save Popponesset Bay, Inc. was formed as a 501 (c) 3 not-for-profit organization, to manage the donations with Greg Smith, its President, and Kevin Harington, Vice President and Treasurer. Al White, one of the people involved with the earlier attempts, became a Board member and Clerk, a position that he holds to this day. The outer channel dredging project was completed later in 1987. This initial dredge was also significant as the substantial amount of material nearly doubled the height and width of the Spit. Today the Town uses fees from taxes on property and excise taxes from docks and boats to keep the outer channel dredged. The dredging has been done almost every year since 1987. The deep water access point, at the southern tip of the Island, between that point and the Spit has filled in several times after storms and broken through on several occasions. After Hurricane Bob in 1991, SPB saw to it that the breach be repaired, the Spit be rebuilt and re-nourished and the Channel be brought back to a depth and width to provide safe navigation. Over the years, the Board of SPB has spent thousands of hours interacting at meetings with Town, State, and Federal agencies to procure the proper permits to ensure the channel be kept safe and navigable. Through this process, SPB has successfully established that the channel has a “right to exist.” Water quality and safe navigation have benefitted from these efforts preserve and protect what is now called the SPB Channel. The Spit and the SPB Channel rely on one another. Until 2002 whenever SPB needed to work on the SPB Channel, SPB had to ask for access agreements from the original owner, Field Point Corporation. This was always an unnecessary drain of resources as legally there was much to address. Kevin Harrington did most of the negotiating with Field Point. He realized that if SPB should attempt to have Fields Point “donate” this property to SPB, then SPB would be in control. After much negotiating Kevin was successful and Field Point (by then a part of New Seabury Corp.) deeded their section of the Spit to SPB. Over the years SPB has undertaken a variety of important initiatives to achieve this mission. For example, in 2003 Cape Wind announced plans to run transmission cables from the offshore wind farm in Nantucket Sound through the Spit and Popponesset Bay as a means of getting the electricity into the local power grid. SPB took the lead in opposing this proposed placement of electrical cables, and through its efforts succeeded in removing as a potential location the fragile Spit and shallow Bay for the electricity transmission cables. The two-year court process was cost SPB over $100,000 but in the end, the Siting Board agreed with SPB’s legal representation that the fragile Spit and shallow Bay were not appropriate for the electricity transmission cables. In 2004, SPB posted signs to comply with Conservation Commission’s decision to keep kayaks and boats from being stored on the Spit to protect the dune grass. SPB has also posted signs to warn swimmers not to swim in the narrow navigation channel in Popponesset Creek at the foot of Popponesset Island. In 2009, the Town of Mashpee approached SPB, requesting financial assistance to support a planned outer- channel dredging project. In exchange for this funding, SPB was able to secure 5000 cubic yards of dredged material which was distributed to areas most in danger of over-wash on the Spit. Most years, the Town coordinates with SPB to place hundreds of cubic yards of dredged sand up (far less than in 2009) onto the Spit. The sand gives new breeding grounds to the endangered plovers and terns and provides substance for the Spit as a barrier beach, protecting dozens of homes on the east side of Popponesset Island from open waters and harsh storms. Also in 2009, SPB planted over 1,500 shoots of dune grass to replace and replenish grassed areas so important to stabilizing the sand on the spit. 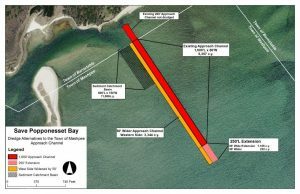 Significant engineering studies have been conducted over the years by our engineering consultant BSC Group to maintain permits required by the State of Massachusetts and Town of Mashpee for dredging the SPB channel and outer channel and placing the spoils up onto the Spit..
To comply with Town laws or Conservation Commission edicts about safety and other issues on the Spit, SPB has encouraged behavior modification over the years with signage about dogs, fires, dune grass protection, trash, endangered species, and prohibiting kayak and boat storage on the Spit. MassAudubon has supported our efforts to install “sand drift fencing” in areas of over-wash on the spit. Their support was critical in receiving approval at the state and local levels for this spit stabilization initiative. The fencing protects the newly planted dune grass which anchors the Spit to provide strength during storms against washovers. SPB and MassAudubon erected over two thousand yards of “symbolic fencing” designed to protect endangered coastal water birds (terns and plovers) during nesting season from April through August. This “string and post” fencing discouraged individuals from walking or running through dune grass areas. MassAudubon has hired and supervised a “beach monitor” to patrol the spit during peak summer hours. This monitor, paid for by SPB as part of the agreement to install the sand drift fencing, greeted visitors, explained rules and regulations, and carried literature about SPB to boaters and others. SPB and MassAudubon worked jointly to produce and install two signs greeting visitors to the spit. These signs, similar to the one installed in 2004, reinforced various rules and guidelines for behavior on the Spit. This diagram depicts future work to make the channel longer, deeper, and wider, while harvesting sand to build up and protect the spit. Timing dependent on permitting and fundraising success. The Spit wildlife sanctuary, co-owned by SPB and Mass Audubon, provides nesting habitat to endangered coastal water birds such as piping plovers and lest terns.